Tickets include a 1 welcome cocktail, 2-course meal, entry to NYE event and a private table on our ground floor bar from 8pm - 10pm. Food will be served at 8.30pm so all ticket holders must be seated by this time. Tables will be reserved from 8pm. Tables will be of 2 -10 people, so please email erica@mothershipgroup.com once youve booked tickets to book a table. so please email erica@mothershipgroup.com once youve booked tickets to book a table. We are excited to announce that this NYE we are going tropical! As always you can expect a carnival of sights and sounds from this East London hotspot and this time around they will be transforming our beloved venue into a jungle paradise. With headline DJ sets from The Nextmen as well as takeovers from Clarks, Unruly, Meltout Crew and NVWLS, DJ sets from Book Club residents and much more! You can expect our basement to be transformed into a rainforest jungle complete with vines, tropical animals and of course the usual genre-bending mash-up of tropical rhythms you have grown to expect (and love) from The Book Club to get your musical juices flowing and booty’s bouncing. 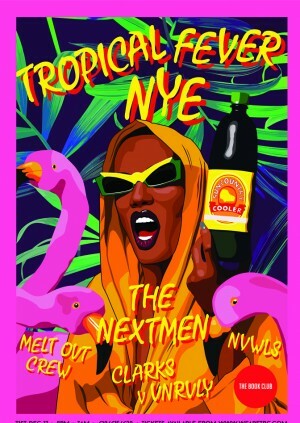 Supporting The Nextmen in our basement will be Unruly, Clarks and NVWLS bringing their own eclectic brands of eclectic tropical delights to the night, from Disco, to hiphop, garage to gime, funk to bass music these guys will be putting your dancing shoes through their paces. On the ground floor, we welcome you to our mystic garden, expect a trippy journey through psychedelic greenery, plants and more as we welcome Meltout Crew back to The Book Club for another NYE host. Playing a heavy mix of R&B, Funk, Soul, Garage, house, bass and Grime, we had to have our favorite party crew back to bring in 2018 in style! On top of all this expect air horns, face painters, dancers, festival décor, giveaways and more!